Eric D. Schabell: Have you ever had an old school design session? I thought some of you out there might appreciate this picture. While looking at a rather complex problem that required a process design, I was presented with this very old school work breakdown structure as the Information Analyst saw it (on the right in the picture, with all them yellow sticky notes just waiting to fall off). It took most of the day in a sort of workshop session to pull the not yet written use cases out of the Information Analysts and many "oh yeah, I forgot to mention..." It resulted in the process design you see here which is then used to roughly estimate the number of man hours needed to implement it. 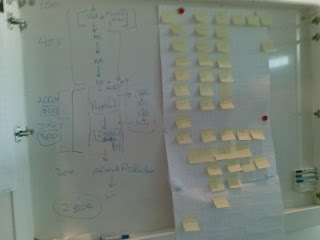 With all the available technology, we are using sticky notes for placeholders, notes in a workbook, and nothing even remotely created in this century... luckily I had my mobile phone camera to be able to capture the work done in this session. Is it just me? Have you ever had days like this on your jBPM projects? So I favor still the good old things we know how to use, where we can focus on what's important and not what's nice to have. And for this story, I call this work.